This dish is robust and flavorful! Its look reminds you of traditional chili, however, it has Black-eye Peas instead of Kidney, Black, Navy or Pinto Beans, and there’s no Cumin or Cilantro. Plus, you probably wouldn’t top it off with shredded cheese. The Ajowan seeds add a smoky peppery taste and they work as a carminative (helps ease gastro intestinal gases which may result from eating beans and lentils). Check Black-eye Peas and discard any bad ones. Rinse and put in deep stock pot (at least 6 quarts). Add 8 cups of tap water. Bring to a boil and boil peas for 2 minutes. Remove from heat and let stand for 1 hour. Dice Green Bell Pepper, Onion and Carrots. Using your fingers break up the whole Tomatoes and set aside with any sauce from can. 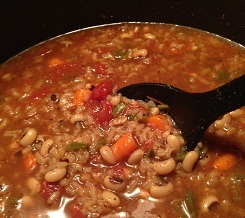 After an hour, drain and rinse Black-eye Peas. Return them to soup pot and add 1 gallon (16 cups) of tap water. Add soup base, Ancho Chile powder, Bay Leafs, Garlic powder, Black Pepper, Rosemary and Ajowan. Adjust any or all of these seasonings to suit your taste. Simmer for up to 1.5 hours till peas are tender but firm. Taste stock to test whether you want more salt or additional seasoning added. Add Rice and all vegetables/remaining ingredients including tomato sauce that was in the can of whole Tomatoes, and continue to simmer for another 15-20 minutes till carrots are tender. Remove from heat and let sit for another 10 minutes (allows rice to continue to cook and absorb some of the liquid) before serving. Remember to remove the Bay Leafs and Rosemary sprig! This dish is a one-pot meal. Serve bowls of soup with artisan breads like Miche, Cracked Wheat, Spelt, Multigrain, or savory Cornbread. A side salad is optional.